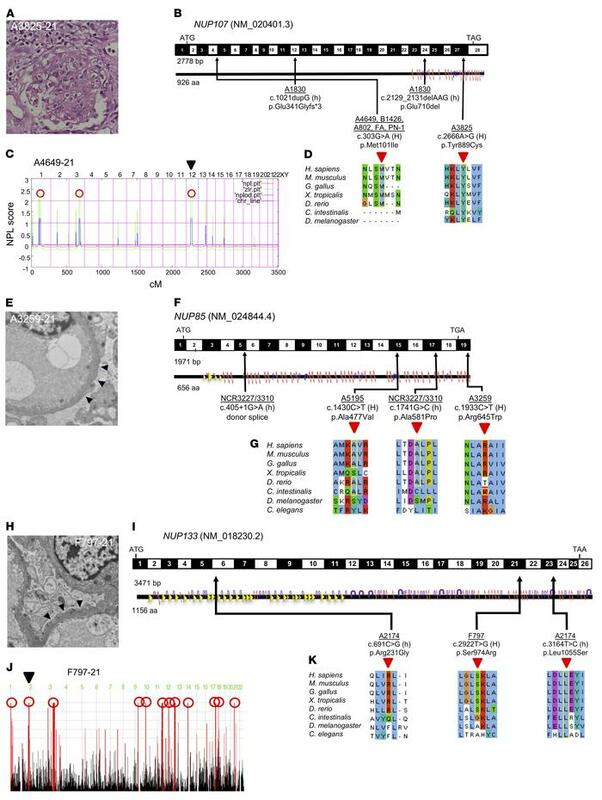 Homozygosity mapping and whole exome sequencing identify recessive mutations of NUP107, NUP85, and NUP133 in 12 families with steroid-resistant nephrotic syndrome. (A) Renal histology of individual A3825-21 (NUP107 mutation) shows diffuse mesangial sclerosis on light microscopy. (B, F, and I) Exon structure of human cDNAs. Positions of start codons and of stop codon are indicated. For protein domain structures, α-helices are depicted as red zigzag lines and β-turns as purple arrows. Arrows indicate positions of pathogenic mutations detected in families with SRNS. H, homozygous; h, heterozygous. (B) Exon structure, protein domain structure, and human mutations of NUP107. (C) Homozygosity mapping identifies 3 recessive candidate loci (red circles) in patient A4649-21. Nonparametric lod (NPL) scores and SNP positions (Affymetrix 250K StyI array) are plotted on human chromosomes concatenated from p-ter (left) to q-ter (right). Genetic distance is given in centimorgans (cM). Whole exome sequencing identifies a homozygous mutation of NUP107 (p.Met101Ile) that is positioned within the maximum NPL peak on chromosome 12 (arrowhead). (D, G, and K) Evolutionary conservation of amino acid residues that are altered in patients with SRNS. (D) Altered amino acid residues of NUP107 (p.Met101Ile, p.Tyr889Cys). (E) Renal histology of A3259-21 (NUP85 mutation) showing podocyte foot process effacement on transmission electron microscopy (TEM) (arrowheads). (F) Exon structure, protein domain structure, and human mutations of NUP85. (G) Altered amino acid residues of NUP85 (p.Ala477Val, p.Ala581Pro, p.Arg645Trp). (H) Renal histology of individual F797-21 (NUP133 mutation) shows podocyte foot process effacement on TEM (arrowheads). (I) Exon structure, protein domain structure, and human mutations of NUP133. (J) Homozygosity mapping in individual F797-21 identifies regions of homozygosity as recessive candidate loci. Within the maximum NPL peak on chromosome 1 (arrowhead), we identified a homozygous mutation in NUP133 (p.Ser974Arg). (K) Altered amino acid residues of NUP133 (p.Arg231Gly, p.Ser974Arg, p.Leu1055Ser).